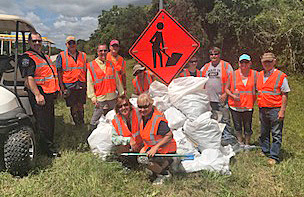 Fourteen Friends of the River, in partnership with TxDOT’s Adopt-a-Highway program, picked up twenty-three bags of litter along a two-mile stretch of FM 2611, before and after the Churchill Bridge on Sat June 3rd. Volunteers included Chairman Mike & Barb Pudlo, Chairman Tom & Angie Ronayne, Ken Wright, Susan Bailey, Kirk Wardlaw, Allen Wardlaw, Juan Chapa, Bebe Vasquez, Fred Kanter, Brian Meagher, and Sophie Meagher. Neal Longbottom, Brazoria Co. Constable Pct 4, provided the highway patrol car alerting traffic of the trash collection. << Here's a big THANK YOU to these volunteers who picked up litter thrown by people who just want to throw their trash along FM 2611 near the San Bernard River. I want to thank the volunteers for their service to this community by picking up the trash along the highway. This is not fun or easy especially enduring the heat and traffic. I just wanted to say Thank You and that I am grateful and appreciate your service!